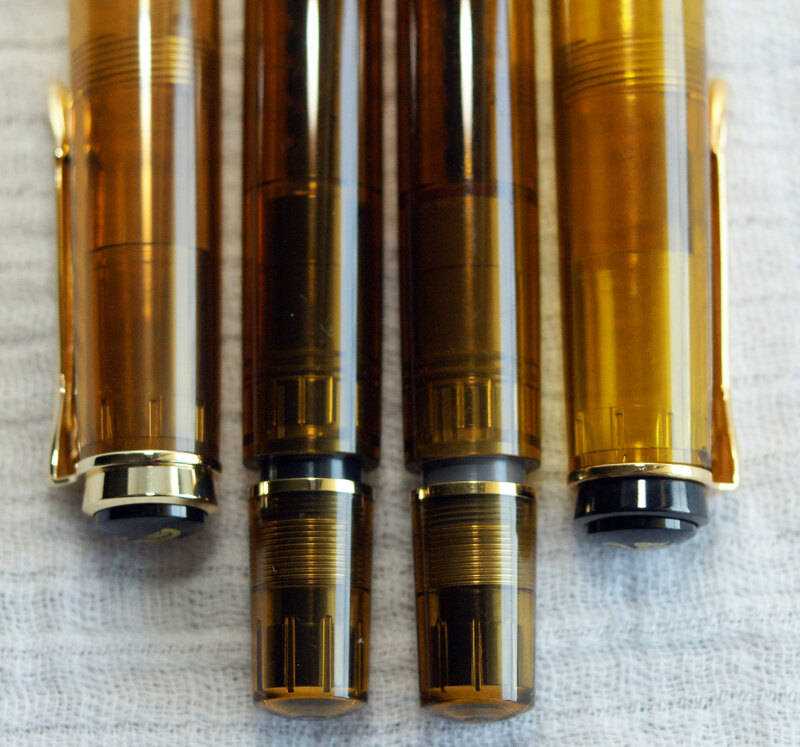 I have been asked on a few occasions over the past several weeks about what is the best way to clean a Pelikan fountain pen. While I’m not sure whether or not my way is the best way, it does work, is easy and relatively quick to accomplish, and does not result in any damage to the pen. One of the reasons that I enjoy Pelikan’s piston fillers is because of the ease with which they can be cleaned when compared with cartridge/converter models. Pelikans are also forgiving and can be left to go a bit longer between routine maintenance sessions than some other brands pens. While cleaning is easy, there are some pitfalls and special considerations to keep in mind, particularly when working with vintage pens. As such, I have two cleaning methods; one that I reserve for modern pens (1970-present) and one that I use for either modern or vintage pens (pre-1970). I will do my best to describe both procedures below as well as provide you with some of my views on the intricacies of Pelikan pen maintenance. 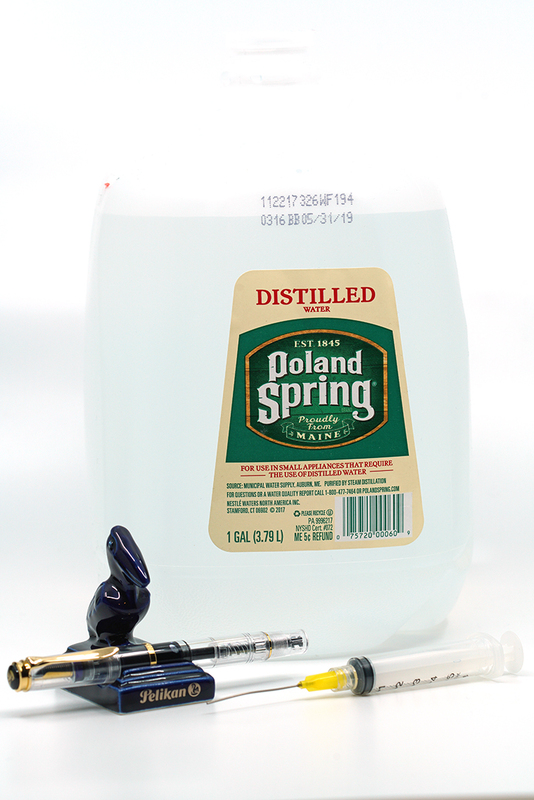 As a bonus, I will also review a technique for the cleaning of a cartridge/converter pen. I recently had a question posed to me about condensation forming on the inside of the cap of a demonstrator and how to best address it. This got me to thinking about a related issue which is ink that can get trapped between the outer and inner caps. It is not uncommon for condensation to form inside a cap and the nature of the demonstrator is to make this phenomenon quite noticeable. The science behind the formation of condensation is fundamental and depends on warm air meeting a cool surface. Pens that are kept close to the body, i.e. a shirt pocket, are warmed to body temperature and condensation forms when the outside of the cap cools faster than the air surrounding the nib. 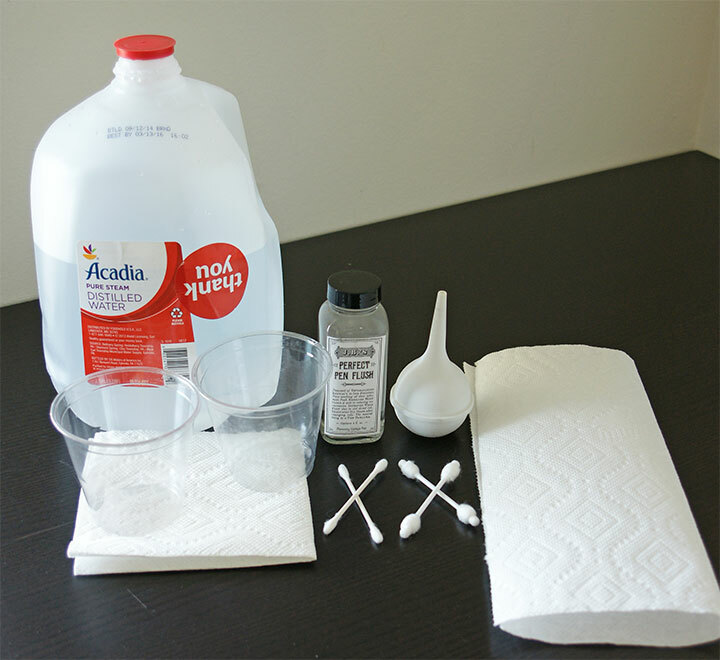 This has no effect on the pen’s performance and usually can be easily wiped away with a cotton swab or towel. More troublesome can be ink that works its way between the outer and inner caps which cannot be easily flushed away with a simple soaking. The remedy for trapped moisture/ink can be the disassembly of the cap which allows the inner cap to be separated and removed to facilitate cleaning. While I do not recommend that this procedure be considered part of routine maintenance, it certainly can be pulled off relatively easily and without any negative consequences. I will describe the procedure below as well as leave you with some thoughts afterwards. There are many reasons, some subjective and others objective, as to why Pelikan pens are as popular and lasting as they are. Undoubtedly, one feature that clearly endears them to novices and enthusiasts alike is the fact that the nibs are interchangeable and, by and large, have been so since the inception of the model 100. The nib is the business end of the pen and if it is not performing as expected or becomes damaged, even the most beautiful fountain pen in the world is rendered useless. I previously discussed these nibs and their ability to be easily exchanged (amongst other attributes) in my post, The Evolution of the Collar, Feed, & Nib. What’s more, not only are the nibs interchangeable but that this can be accomplished by the end-user and does not require a sometimes lengthy trip back to the manufacturer or a certified dealer, certainly a boon to the user. These facts combine to allow one pen to take on a significant amount of character as Pelikan’s catalogue of nibs over the years has contained a wide variety of expressive options, not to mention the variety of custom grinds available from third parties today. Even if you only own one nib, the ability to change nibs can come in quite handy in the event of accidental damage (why is it that all uncapped pens insist on landing nib side down?). I could continue to expound on the virtues of the interchangeable nib but that is not our purpose today. Today, I want to review for you exactly how to safely remove and replace a nib because this can be an area of confusion for many and some forethought should be employed prior to attempting. Rest assured, however, that this is a safe procedure which can be carried out without much difficulty or skill. From time to time, I plan to focus on simple ‘How-To’ pieces that address fixes and/or maintenance that can be undertaken by the pen enthusiast at home. Since I am not a pen repair professional, the advice that I convey should not be construed as coming from such and professional help should be sought for more advanced issues. I will focus on issues that arise from regular use which can be repaired with a certain degree of ease resulting in a high likelihood of success. My first such post was about lubricating the piston, perhaps the single most important maintenance a Pelikan piston filler would ever require. While thinking about this post, I recalled one question that I see asked fairly often and it has to do with a loose piston knob. While not necessarily affecting the function of the pen, it can be very disconcerting to an enthusiast who wants their pen to function according to factory specifications. This is a problem that can develop on some models, especially lower tier ones, owing to the fact that they more commonly have a friction fitted or snap fitted piston assembly. The normal behavior of the piston knob should be for it to sit securely against the barrel and not have any travel or play when the piston is in it’s fully retracted position. Please note that I am not discussing the normal 1/8th of a turn delay in piston engagement which is actually quite normal. What can happen though is that travel or play develops in the piston knob, even when the piston assembly is in the retracted position, keeping the knob from seating itself securely against the barrel. I find that lubricating a Pelikan piston results in confusion for a lot of neophytes to the brand and is frequently a topic of discussion on the forums. Today I will try to dispel any questions by discussing the theory behind this procedure as well as the technique. Once you know, it is really quite a simple procedure that anyone can do in just a few minutes time. While this operation is tried and true and incredibly simple, I must stress that any issues that arise during this operation fall squarely on the operator’s shoulders and I’ll assume no liability for any mishaps.